A lifelong love of good food and drink has taken Israel’s leading gastronomist from the family dinner table to Paris to Israel’s evolving restaurant scene. It’s a warm, sunny winter morning in Tel Aviv, and Daniel Rogov is starting the day as he usually does: with cigarettes, croissants and coffee, “sometimes two or three of each,” he says with a laugh. The café isn’t the only dining establishment where Rogov’s reputation precedes him. As the wine and restaurant critic for the newspaper Ha’aretz and the author of the well-regarded, annual Rogov’s Guide to Israeli Wines (Toby Press), his appearance in dining rooms and at wineries can sometimes have chefs, sommeliers and wait staff running for cover. A love of gastronomy was ingrained in Rogov from an early age. The son of financially comfortable, cultured Russian immigrants, Rogov grew up in New York in Borough Park, Brooklyn, “But a Borough Park before it was religious,” says the man who claims his desert-island meal of choice is lobster thermidor and Belon oysters. As a child, Rogov and his family would sit around the dinner table debating the existence of a divine power, but inevitably the conversation would turn to food. “I was lucky enough to grow up in a family where fine food and wine were important,” he recalls. After graduating young from high school, his father offered him a car as a gift for his exemplary grades, but he chose something altogether more exotic: plane fare to Paris. Within days of arriving in the City of Lights, he says he fell in love with French wines and French food. A self-described “intrinsically lazy human being,” Rogov eschewed physical labor for working his cerebellum instead. To earn his keep without a handout from his parents, he says he began submitting articles on spec to The Boston Globe and The New York Times, several of which were accepted, the editors ignorant to just how wet behind the ears he was. When he arrived in Israel, the wine industry was in its infancy, producing its fair share of sacramental, Seder-friendly syrup and a few varietals, but nothing to write home—or abroad—about. Around the same time, a professor visiting Israel from the University of California at Davis declared the northern Golan Heights an ideal grape-growing territory, and a new wine movement was born. When the Golan Heights Winery released its first vintages in 1983, Rogov showed up unannounced at the winery’s doorstep for a tasting. “The wines were so good, I thought they had imported, and rebottled, wines from France,” he recalls. When convinced the wines were legitimate, he embraced them and began to spread the word. A couple of years later, he was hired as a full-time writer by Ha’aretz, a job that also included surveying the equally nascent restaurant scene. Until the mid-1980s, most restaurants in Israel fell into two categories: ethnic spots for favorites like falafel, shawarma and hummus, and so-called “workers’ restaurants,” lunch joints perfect for filling up on simple, often heavy, ethnic food. Then the Israeli economy began to burgeon, people suddenly had expendable income, and the population began to travel in large numbers. A small group of influential chefs started opening intimate, iconic restaurants that changed the face of Tel Aviv dining forever. “All of a sudden the locals began waking up to the fact that food and wine were an integral part of the cultured way of life,” Rogov says. Chefs began training abroad, returning home to fuse the cuisines of their ethnic heritage with modern culinary know-how. The trend, called the New Israeli Kitchen, has influenced the culinary movement and the restaurant scene, reflected in dishes containing date syrup, tahini, za’atar and a host of spices and cooking traditions culled from the more than 70 ethnicities that make up the Israeli melting pot. This lifestyle shift has also included an increased consumption of wine (though Israelis still consume a paltry amount when compared to Europeans and Americans), and the industry has responded. A decade ago, one could almost count Israeli wineries on two hands; now, between large producers and boutique winemakers, there are more than 200. This proliferation prompted Rogov to write a compact guide that has been published annually since 2005. The book has gotten fatter and fatter every year, and although Rogov has shouldered occasional criticism for being a biased cheerleader for Israeli wines, he gives solid backup for his positions. While Rogov visits practically every winery in the guide, most of the hard work takes place in his home cellar, a space that holds hundreds of bottles of wine and to which only his wife, assistant and cleaning lady are allowed access. 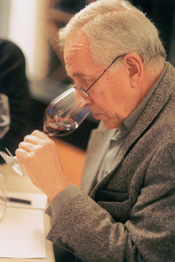 Several mornings a week, he tastes 30 to 40 wines, scribbling extensive notes by hand that are later transcribed to computer. Rogov’s standards may be high, but he looks at criticism as a way to advance the Israeli gastronomic culture. “Some critics don’t even seem to enjoy what they’re doing,” says Haim Cohen. As one of the pioneers of the New Israeli Kitchen, Cohen has known Rogov since the 1980s, when the critic gave his cooking at the now-closed Keren restaurant a favorable review. “Rogov likes to engage with the chefs, to talk to them, to find out what it is they are up to and what they are cooking.” Cohen has always found Rogov’s criticism to be constructive. “You may not always like what he has to say, but he is never mean-spirited,” he adds. So how does such a well-known face walk into a Tel Aviv restaurant and build an unbiased review? To sidestep his fame, Rogov employs tricks he has accumulated over a quarter century’s experience. While a chef can send out the best cut of steak if he knows who his audience is, he cannot control dishes that were made before service, so Rogov always orders soups and pastas. “If the ravioli’s bad, it’s bad,” he notes. “They’re not going to be able to do anything about it.” He will also prestudy a menu, then send friends in advance to place an order, walking in only as the food arrives. Rogov is also the author of Rogues, Writers & Whores: Dining With the Rich & Infamous (Toby Press), an illustrated book recounting the tales of 69 foods and the personalities after whom they were named. And though his tastes veer toward haute cuisine, he is not immune to the pleasures of Israeli street food. Several times a week he makes a light lunch of a falafel pita sandwich with tahini, hummus and white cabbage at Falafel Gina, a classic Tel Aviv joint. “It is one of the best meals you can have in Israel,” he says. Some time after our Tel Aviv coffee date, I reunited with Rogov in New York, where he had been flown in for a kosher wine event and to sign copies of his 2009 wine guide. “I’m drinking this for enjoyment, not for tasting, so fill it up!” he said as he extended his glass across the tasting table. Everywhere he turned, people reached out to shake his hand, ask for his recommendations or just kibitz. He graciously obliged before sitting down to sign copies of his book, which now sells about 10,000 copies per year—impressive for a specialty publication in a niche market. Yarden, Katzrin, 2004 – Deep garnet purple hue, generously oaky, hints of layered fruit, pepper and Mediterranean herbs. Castel, Grand Vin, 2006 – Dense, near-sweet, full-bodied, flavors of currants, berries and bitter chocolate. Yatir, Yatir Forest, 2005 – Soft tannins, lightly woodsy, spicy berry and cassis aromas. Carmel, Limited Edition, 2004 – Notes of blackberry and cherry, hints of pepper, anise and cigar box aromas and flavors. Galil Mountain, Yiron, 2005 – Full-bodied, Bordeaux-style with concentrated fruit, velvety tannins and a long finish.